The Urban Condominium. One of the most popular low rise condominiums in the City, which is only 500 meters far from the Pattaya Beach!! 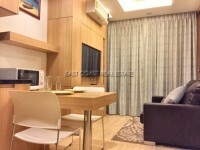 The condo complex is located between Soi Bua Khao and Pattaya 2nd Road. This condo unit will come fully furnished, fully air conditioned, European kitchen, walk in wardrobe, flat screen Televisions. The building provides: 24 hour security, CCTV, Key card access in to the building, communal swimming pool, gym, games room, library, Laundry service, Maid service, FREE WIFI and FREE Cable TV. This condo is available for rent with a minimum of a 12 month contract at 23,000Baht/month and for sale at 3,600,000Baht, the title deed is in foreign name with Tax and Transfer to be split 50/50 Buyer and Seller. Please contact EAST COAST for more information.